It was so typically and positively Australian. Six runs were required, an lbw appeal - which looked plumb by the way - had just been turned down, and the batsman was out of his crease. Steven Smith, not even playing the Test, on as a substitute for Doug Bollinger, let the throw rip with nobody backing up. Not many young substitutes in the world would have had the presence of the mind, or the heart to go for that throw. It narrowly missed the stumps and went for four overthrows. The Indian batsmen jumped for joy, and the crowd went delirious. Johnson then fired one down the leg side, and it was all over. This play will be remembered for how it released the pressure that was built through hard work over the three preceding overs, but we wouldn't have it any other way from an Australian. If there is a direct hit that can get Australia a win, it has to be gone for. 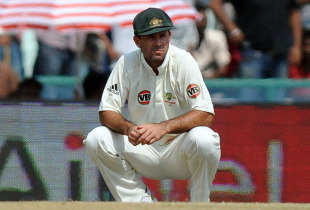 Ricky Ponting, still coming to terms with this gut-wrenching defeat, spoke candidly in the post-match press conference. He was a defeated man, but still deservedly proud of his team. Smith's work was a perfect example of how much value Australia added to the Test. "You feel sorry for Smithy," Ponting said. "Young bloke always looking for ways to win the game. Had he hit the stumps it would have been game over. That's what we expect from our guys. If there is a half chance we are going to take it. "If that was me, I would have done exactly the same thing. I wouldn't have worried about who is behind the stumps. If I have a chance to hit the stumps and win a Test match, I am going to take it. There is certainly no blame going Smith's way. That's a great attitude for the young bloke to have." Smith was obviously disappointed during that chaotic last over. "We have all spoken to him," Ponting said. "He was a bit disappointed coming off the ground, but there is no need to be, he saw the stumps, he saw the win there, he had a go and missed. Cost us four runs. Not much more you can say." This wasn't obviously all that Australia brought to Mohali, but it summed up their attitude over the last five days. They might not be the same dominating side of the last decade, but they are going to make it difficult for sides to beat them. They just won't go away, and whenever there is a single stump visible for a Test win, they will go for it. That played its part in making this Test great. That is what Australia need to be thanked for.